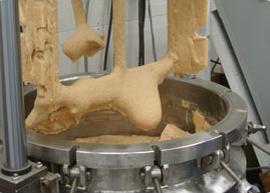 Volume: 150 liter maximum operating batch size with 3" extra free board. 35 liter minimum operating level for homogenizer mixer (anchor/scraper agitation can operate until vessel is completely empty). Dimensions: 22" inside diameter with 3" deep ASME dished bottom head and 30" straight side. Heat Transfer: 2 zone 12 gauge dimple jacketed for heating/cooling at 30 psig. temperature probe with digital output. Support: (3) 3" ASA T-304 S/S pipe legs with floor flanges with (4) bolt holes on natural centerline. Bottom Outlet: 1-1/2" diameter flush bottom ball valve with 1.5" dia. tri-clamp style fitting 15" from bottom of valve to floor. 2. 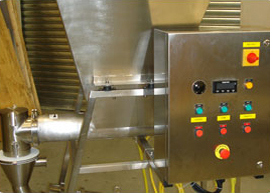 Stationary middle quadrant with lip seals on all openings for mixers hinged cover on operator side. Configuration: Tubular anchor with one lower cross support on 2" diameter drive shaft. Scrapers: (20) [estimated] PTFE (Teflon) scraper blades affixed to anchor provide ½" of over lapping scraping action on all heat transfer surfaces. 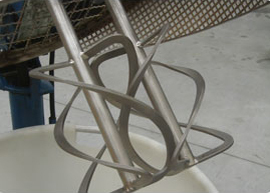 Blades are attached to anchor by ½" diameter continuous teflon rods. No screws, clamps, cotter pins, threaded parts are required. Teflon resistance to temperatures over 280 deg. 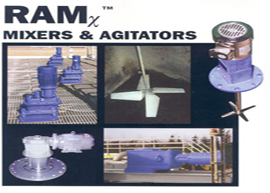 F to provide longest life in steam heat transfer service. 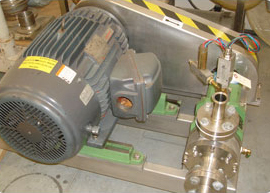 Configuration: Model CJ-20-2 Reversible Homogenizing mixer, 33" immersion length, 4" dia., 3 blade rotor on 0.75" diameter shaft with Rulon bearing. Four support rods hold 7" diameter rotor housing with 7" diameter adjustable baffle plate. 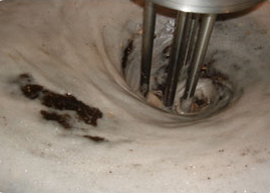 down-mode; high speed (3600 RPM) homogenization, emulsification and dispersion in up-mode; atmospheric deaeration by operation in up-mode at intermediate speed. 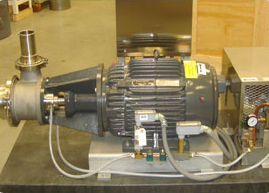 Power package: 3 HP, 3600 RPM, 460 volt, 3 phase, 60 Hz, TEFC wash down duty motor.